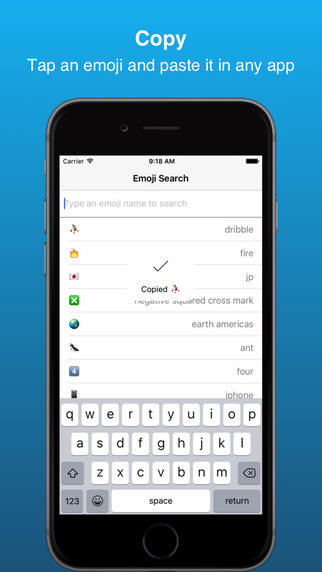 Paste is an emoji search app to quickly search for and copy emoji and paste them anywhere else. Now it is easier than ever to find the perfect emoji. No more swiping through long and large grids of emoji for minutes just to find the right one! Have you ever spent more than a minute swiping through the Emoji Keyboard looking for a particular emoji? You know it exists, but swear you can't find it. Ever even just give up? Paste eases that frustration. Instead of swiping around for a particularly hard to find emoji or giving up, just open up Paste and search for it by name. When you select one of the search results, the emoji is immediately copied. Go back to the original app and just paste it in.